Rob Cesternino and Akiva Wienerkur gathered once again to discuss “The Statue”, the next episode in season two of the Seinfeld series. The episode, which aired on April 11, 1991 was not a favorite for either, where there were many things out of character from a typical episode. Their off-the-cuff analysis was that too much time was spent on the unlikeable characters of Rava and Ray, neither of whom Akiva and Rob found to be funny. Other points they noted throughout the podcast were the many plot holes, and questions left unanswered, most importantly, whether or not Ray stole the statue. Rob found some of the Kramer scenes funny, and enjoyed the playing of inka-dink, but other than that, deemed this episode 11th out of the 11 so far. Akiva found it better than a few episodes from season one, but mentioned several times that many of the jokes were far too “sitcomy”. Akiva also shared some of his research on the episode before the plot breakdown. The episode was written by Larry Charles, who would be a major writer on Larry David’s Curb Your Enthusiasm, and also was a writer for Sasha Baron Cohen’s movies, Borat and The Dictator. He also learned that Nurit Koppel, the actress who played Rava was a girlfriend of comedian Richard Lewis, a longtime friend to Jerry and Larry David. She had apparently broken up with Richard shortly before the guest-starring role. In additional research, he learned that the actor playing Ray, Michael D. Conway had done nothing for 15 years after this episode, but nowadays is a regular working actor. Rob had read some production notes that talked about how this episode was really where the writers started to develop the Kramer character. Their summary of the show was more a factual recount for them, with less debating of their opinions than previous recaps, since most of their insight was about the clunky storyline. Jerry’s standup in the opening credits once again did not tie into the episode plot. The bit was about mail in sweepstakes, which both Rob and Akiva found very dated. The episode begins with Jerry dragging a filthy box from his storage unit that Kramer saw earlier and wanted to dig through. 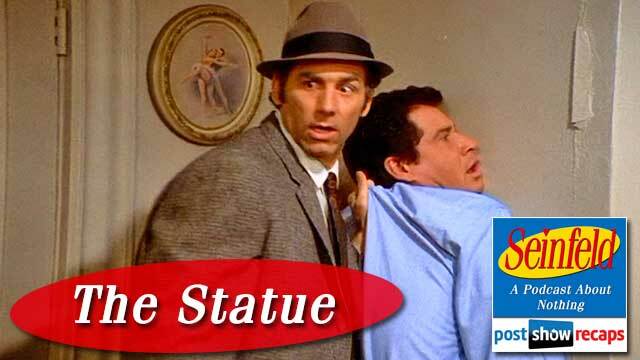 Kramer finds a statue in the mix, which George is dying to have, since it’s exactly the same as one his mother had that he had broken when he was a kid. He refers to the statue breaking as one of the worst experiences of his childhood. Kramer doesn’t want to give the statue up, and after some wrestling for it between him and George, Jerry tells the “numskulls” to break it up, and they’ll decide it with a round of “inka-dink”. George is picked as “it”, which they argue over if it means he wins or loses. Jerry confirms George gets to keep it, though he tells George after the fact that it meant he lost, so George owes him one. In the next scene, Elaine and her new friend Rava are in Jerry’s apartment, and Elaine is hoping to edit the book of Rava, who is a Finnish bookwriter she’s been working with. She’s a strange character, smoking in Jerry’s apartment, acting very depressed. Her boyfriend Ray shows up, who is a pretentious grad student that Jerry describes as verbose. He moonlights as housekeeper, and is there to clean Jerry’s apartment. Jerry marvels at how well Ray does with the cleaning when he returns. In the second stand up spot, Jerry’s bit is about the guilt he feels when a housekeeper cleans his house. Rob and Akiva both related to how Jerry feels, as they feel guilty when their wives are cleaning around them. Rob suggested to the listeners that a good plan is to save money and just do the housework while listening to podcasts. Jerry and Elaine both head over to Rava’s place soon after. They are all talking, and we get the first mention of Elaine’s boss Mr. Lippman. Rob and Akiva found the premise of Jerry even being there with Elaine strange. While there, Jerry spots the statue, and is 99 percent sure that its from his apartment, stolen by Ray when he cleaned. Elaine doesn’t want him to push it by accusing, thinking it could ruin her chance to edit the book. Akiva and Rob wondered why Ray would have this statue out if he just stole it from Jerry’s. Rob agreed that there are many plot holes in this sequence. They both felt if this were a later episode in the series, the story would have concluded with the notion that Ray didn’t actually take it . After they leave Rava’s apartment, we have the first scene where all four of the main characters are in it together. Jerry had called the police, who told him they can’t do anything for him. Kramer wants to “go get him”, Elaine wants him to forget it, but George says he can’t because his mother is expecting this great surprise, and she’s making her famous potatoes. Jerry decides to call Ray and confront him, and they meet at Monk’s to discuss, where George sits inconspicuously in the next booth. During the conversation, Ray plays dumb when asked if he took the statue. He claims he got it at a pawn shop. After enough denying from Ray, George finally snaps, calling him a liar and a thief. Ray doesn’t back down, and even redirects the accusations by accusing them of wanting to move in on Rava. We then have a scene with Rava and Elaine riding in the elevator up to Pendant Publishing. Rava is smoking, which Rob and Akiva thought might have not been as taboo in ’91 as it would be now. The scene has the elevator popping open at each floor, with a bit of Elaine and Rava’s discussion about whether Ray’s having the statue was a coincidence or not. Rob found this a strange sequence. The ladies’ discussion turns into an argument with Rava accusing Elaine and Jerry of being jealous of her and Ray’s love. The scene ends with Elaine tossing Rava’s manuscript in the garbage on her way out. George opens the next scene on the phone with his mother, telling her there will be no statue. He doesn’t understand how this outcome could affect his having the potatoes, and is so distraught, he tells Jerry that the whole experience has made him even more bitter, more jaded. Elaine laments that instead of editing a book for a promising young writer, she is now proofreading a food allergy cookbook. The next scene has Kramer, who is out of their building for the first time in the series, pounding on Ray’s door, impersonating a police officer. Once inside, he grabs Ray and tells him to “make love to that wall, pervert”. He accuses him of burglary, grand larceny, and murder. When Ray isn’t looking, Kramer stuffs the statue in a bag and hightails it out of there to go show Jerry and George. George is ecstatic, so much so that when Kramer slaps him on the back, he promptly drops the statue, which shatters. The stand up in the closing credits is a bit Jerry does where he’s cynical about how people steal. 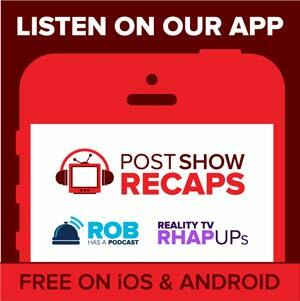 After recapping, Akiva and Rob discussed whether the episode would hold up in 2014. They thought it mostly would, though Rob felt that Jerry could have discreetly texted Kramer to have him double check his apartment for the statue before making the accusation, as opposed to calling him. They also read a few listener emails. Hunter asked them to explain the rules of potato man, which they gave the simple explanation of. Next, listener Alexander made a few points about the episode. He thought the set used for Rava’s apartment was one used in other episodes throughout the series. He also found it strange that Jerry pretends to be talking to his mom, though he revealed that she lives in Florida, which would make that a long distance call in 1991. Both Rob and Akiva didn’t notice these points at first, but agreed with Alexander. Listener Chester emailed them a few of his own points. He found it hard to believe that Ray would know that the pawn shop owner had moved to Singapore. He also added that Jerry listing his tape recorder as one of the items Ray could have stolen made the episode seem quite dated. Next week, the guys will recap the episode titled “The Revenge”. Akiva thought that it will be a much more positive recap than this one. Rob couldn’t quite remember the plot, which should make it a fun re-watch. Keep the comments coming on Twitter, @robcesternino and @keev26. You can also post comments on the website page atpostshowrecaps.com, and email questions to [email protected].